Get away from your day-to-day. It was Albert Einstein who said that insanity is doing the same thing over and over again and expecting different results. Similarly, you will keep producing the same results, even with your best people, if you keep turning up to the same office and going through the same routine each day. This is why off-site meetings are so valuable. When you need to address critical issues, set strategic direction, build teams, stimulate your staff to accomplish transformative and meaningful outcomes, you need to go somewhere that is inspiring, distraction-free and far away from routine responsibilities that can be addressed at some other time. Meetings that achieve the best results don’t start on the day the participants arrive; they start days, weeks, or even months in advance. The meeting convener and the meeting facilitator should determine the purpose of the meeting, and who needs to be involved, in order to achieve that purpose. A good facilitator will consult with key stakeholders to further understand the issues and obstacles to achieving the goal, simultaneously ensuring attendees are committed to the goal and are well prepared for the meeting by providing all necessary background materials to participants to read and digest in advance. This way, valuable time for reaching decisions is not wasted presenting and reviewing materials, and death by PowerPoint is avoided. Don’t underestimate how much preparation is required to make the very best of your meeting, but equally understand that this is time, and money, well spent if the right outcomes are reached. Start with outcomes, not agendas. We’ve all been to annual meetings with no real goal or meetings with vague goals like “build a stronger team.” Sure, it’s nice to have an easy day of work, but what is your organization’s actual return on investment for events like these? Rather than planning a meeting to take up time, use your meeting to make the most of your time by establishing expectations at the outset and assigning SMART objectives for meeting participants to work towards following the meeting. SMART objectives are: Specific, Measurable, Achievable, Realistic and Timely. Furthermore, realize that you won’t have time to answer every question or solve every problem that arises during the course of the meeting. Don’t get sidetracked by tangential issues; rather, use a parking lot to park issues that are organizationally important, but not relevant to the specific objectives of the meeting. There’s a lot to get through and the agenda is packed, but it’s important to ensure that time to reflect is built into your schedule. 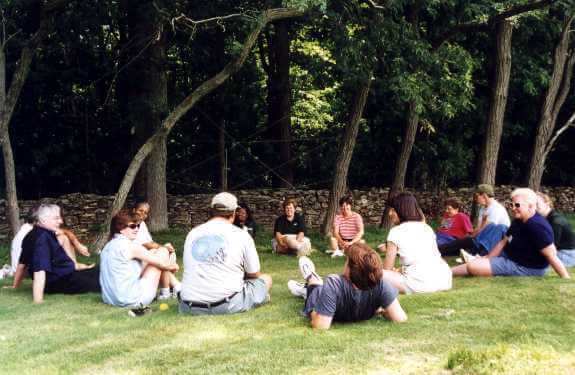 Reflection time may be spent individually, in small groups (we like to encourage our guests to get outside and connect with nature to inspire deep, informed reflection), or in a larger group reflecting upon what was decided in previous sessions. Phone and video conferencing are important and necessary means of keeping up-to-date with partners in the 21st century. However, when achieving your best results is your goal, 88% of people feel that meeting face-to-face is more effective than video conferencing (AirPlus International 2011 Survey of Corporate Travel Buyers). When you’re all together, team members are more aware of non-verbal cues that are commonly missed over video or phone conferencing, like hand gestures and facial expressions. These cues allow team members to better understand one another and cut to the core of important issues. Schedule a time to gather your best people in one place to achieve your best results. It’s important to get the widest range of views, but it can be hard to achieve full participation at meetings. Every team has their quiet or curmudgeonly members; others are intimidated by their boss, and it doesn’t help that the CEO is sitting in the back of the room. Don’t let this be the inhibiting factor to achieving your team’s full potential. Start your meeting with an energizing, ice breaking, or even silly activity that requires the engagement of everyone in the room, and establishes a safe environment for your more reserved team members. Good facilitators have many techniques to ensure everyone participates and has their say. It’s important to establish a safe environment, where everyone is comfortable expressing honest opinions rather than simply saying what they think the CEO wants to hear. Use break-out groups, anonymous voting games, and card exercises so that you can quantify team members’ opinions without personalizing them. When decisions are made, make sure follow-up tasks have a clear owner and time frame for completion. Remember, the owner is not necessarily the person responsible for the follow-up action, someone else may do the work, but the owner is accountable for ensuring it happens. Also, don’t expect to get everything done or answer every question by the end of the agenda. The Parking Lot will likely be packed with more issues that need addressing. Prioritize these and establish work groups to deal with them, or to at least scope out the issues in greater detail. This seems like a no-brainer, but it is one of the most commonly overlooked elements of getting the most out of your meeting. When was the last time you attended a meeting with a designated note-taker? Individual meeting attendees tend to only jot down the notes relevant to their job, and on return to their busy daily routines failing to recall important takeaways. Designate someone to record your meeting’s expectations, important information conveyed, questions answered, questions left unanswered, outcomes, action items, workgroups established, and individuals’ follow-up responsibilities. This doesn’t have to be the same person for every session, nor does it require that every word is recorded verbatim – although it is best to use a consistent format for recording who said what, which decisions were made and what actions have been agreed upon. Smartphones are great for recording too, and it’s a good idea to take photos of all those flip chart pages before they go missing. is will ensure your meeting is the beginning of a path forward, not just a vague memory of the past.